With Millcreek Community Hospital’s convenient location, you have the ease of being 5 minutes from I-90, I-79, the Millcreek Mall, and many near-by restaurants and hotels. We’ve invested in free parking for you, near the hospital entrance. So coming to MCH is easy, quick and convenient. 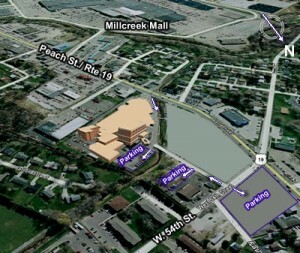 This graphic shows the general areas of parking open to you as we complete our construction.